Eric Ives once said that “what we know about Mary Boleyn can be written on a postcard with rooms to spare”. The same could be said for her sister-in-law, Jane Boleyn. We know so little about Jane that every biography of her must rely more on suppositions than facts. Therefore, when author Julia Fox set down to writing, she didn’t have an easy task on her hands. She admirably rose to the challenge, and yet the final result, Jane Boleyn: The True Story Of The Infamous Lady Rochford, fails to bring the real Jane Boleyn to life. What it doesn’t fail to do, though, is debunk the myths and legends that, mainly due to popular culture and novels, have surrounded Jane Boleyn. Lady Rochford is often depicted in books and movies like a jealous and nasty woman who gave evidence against her husband and sister-in-law, thus sending them to their deaths, and who aided the romance between the young and silly Queen Catherine Howard and Thomas Culpepper, which cost them all their lives. Fox argues that there is no proof that Jane hated her husband George or that their marriage was unhappy. She had no reason for wanting him dead. On the contrary, it was in her interest that George should be cleared of all charges and survive. The Boleyn family, of which Jane was a member, was very wealthy and powerful, so why would she have wanted to exchange her secure life for that, much more precarious and poorer, of a traitor’s wife? Fox also tries to explain Jane’s role in Queen Catherine’s affair. Jane had managed to get back into the King’s favour after the downfall of her family and carve a successful career for herself at court. Her job was to serve the Queen and that’s what she did. When she realised what her young mistress was really up to and had involved her into, it was too late. She decided to keep silent. It was the wrong choice and she paid for it with her life. Although Fox manages to clear her tarnished reputation, the real Jane Boleyn still proves elusive. Rather than discussing what Jane did, said and felt, the book relates what Jane is supposed to have done and the events she is supposed to have attended. Because of this, the reader can feel like he/she’s reading, instead of a biography, a summary of all the main events that occurred during Henry VIII’s reign that Jane supposedly witnessed. While it is true that every event is seen through Jane’s eyes and the role she would have had in them, the words “probably”, “likely”, and “possibly” appear so often in the text that they can make you doubt that Jane was there at all. This, however, isn’t Fox’s fault. Fox has done a marvellous job at researching Jane’s life and fitting the pieces (too many of which are too sadly still missing) of her puzzle together, so as to present the most accurate portrait possible. And she does so in a straightforward and entertaining way. Her writing style is very readable, which makes the book flow easily. I really can’t fault her work and I look forward to reading more of her books in the future. But, unfortunately, there just isn’t enough information to write a biography on Jane yet (and there may never be). That’s why I recommend this book only to Tudor newbies or to those who are convinced that Jane is really the infamous woman she’s so often portrayed to be. Just don’t expect any new information, groundbreaking theory or even just a better understanding of what kind of woman Jane really was. 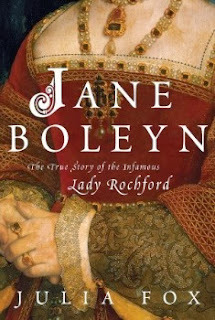 Jane Boleyn: The True Story Of The Infamous Lady Rochford by Julia Fox is a readable and enjoyable biography that sets the record straight on the myths that surround this much maligned Tudor figure. However the book, rather than discussing what Jane did focuses on the events that she is supposed to have attended. It’s a book based more on suppositions than facts, but that’s due to the scarcity of information on Jane, not on any fault or shortcoming of the author.